Scéal speisiúil sa Sunday Tribune inniu – beidh sé ar líne anseo ar an Luan – ag tabhairt chun solais plean Fhoras na Gaeilge seisear déag fostaí nua a earcú go luath, in ainneoin an choisc ar earcaíocht san earnáil phoiblí. Ar ndóigh ní scéal nua ar bith é seo ann féin do leitheoirí iGaeilge – ag an am chéanna, tá an ‘míniú’ nó ‘cosaint’ a thug Roinn Uí Chuív don Tribune spéisiúil. Seo agaibh é, i mBéarla blasta Ken Foxe, an tuairisceoir a bhris John O’Donoghue as a phost. The department defended the appointments and said they were existing jobs which had been ‘held open’ because of a dispute over decentralisation. They [The Department is dócha] also said the recreuitment freeze did not apply to north-south bodies, of which Foras na Gaeilge, the agency involved, is one. A statement said: The posts that have now been approved for advertising include vacancies that were held open pending resolution of the decentralisation issue case taken by the Unions representing Foras na Gaeilge staff to the Labour Relations Commission. 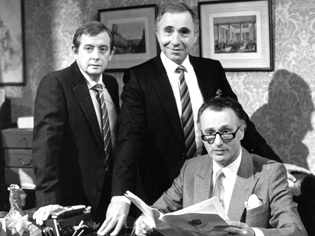 Míniú é sin a bheadh ina údar bhróid ag Sir Humphrey féin. Ní postanna sa bhreis iad seo – is postanna iad atá mar chuid d’fhoireann an Fhorais nach bhfuil líonta go dtí seo de bharr an aighnis idir foireann an Fhorais agus an Roinn faoi dhílarú – agus mar sin ní sharaíonn siad an chosc ar earcú san earnáil phoiblí. Anuas ar sin, toisc gur gniomhaireacht thuaidh theas é, ní bhaineann an cosc sin leis an Fhoras ar aon nós! Níl Sir Humphrey ar shlí na fírinne, tá sé beo leis ag obair leis an Roinn Ghnóthaí Pobail, Tuaithe agus Gaeltachta i nDún Aimhirgín ar Bhóthar Mespil i mBaile Atha Cliath. Ní h–é go bhfuil deacracht ar leith agam le Foras na Gaeilge bheith ag earcú. An deacracht atá agam leis an scéal seo gurb é mo thuiscint go mbeidh eagrais atá ag obair ag cur chun cinn na Gaeilge i measc an phobail thíos leis an earcaíocht seo. Tá buiséad Fhoras na Gaeilge laghdaithe sa Bhuiséad. Tá costaisí breise ag gabhail leis an earcaíocht seo – suas go €800,000 de réir an Tribune. Is giorra é do €1m dar liom nó biionn tuarastal agus costas an phoist – féach ar an míniú casta neamh leithscéalach a thugtar ar cheist na n-innealtóirí teanga i scéal an Tribuen – níos mó ar Fhoras na Gaeilge ná mar atá sé ar na sclabhaithe atá sa chéad líne catha. Mar sin de ligfear chun siúil go leor gniomhaithe – níos nó 16 ar aon nós – atá ag obair ar son na Gaeilge i measc an phobail chun go mbeidh Foras na Gaeilge ábalta cur leis an maorláthas atá á fhás acu i mBaile Atha Cliath,Béal Feirste, Gaoth Dobhair. Agus, díreach chun mo phointe a chruthú, seo chugainn an ‘t-atbhreithniú’ atá mar sprioc aige líon na n-eagrasaí Ghaeilge a laghdú ó 19 go 1…..
Foilsiú: 13/12/2009 . igaeilge a d’fhoilsigh. Ranganna: An Ghaeilge, Cúrsaí Reatha. Clibeanna: An Roinn Ghnóthaí Pobail, Foras na Gaeilge, Sir Humphrey, Tuaithe agus Gaeltachta. Tá an tuairimíocht ag dul i dtreise inniu agus ullmhuithe á dhéanamh le h-aghaidh foilsiú thuairisc an Bhoird Snip Nua go molfar deireadh a chur leis an Roinn Ghnóthaí Pobail, Tuaithe agus Gaeltachta. Ar ndóigh más amhlaidh go ndeintear an moladh sin i dtuairisc an ghrúpa atá faoi stiúr Colm McCarthy, ní gá go nglacfar leis ach tá furmhór na meáin ar maidin ag moladh go nglacfar leis scun scan nach mór, cibé rud a mholtar ann, agus iad ag súil go mbuailfear pá na seirbhíse poiblí – agus postanna san earnáil céanna. Is cluiche é seo agus ní bheidh buaiteoirí ann. Más amhlaidh go gcuirtear deireadh le Roinn Uí Chuív, is é todhchaí na Gaeltachta féin an cheist is mó a fhagtar gan freagra. Cé nglacfaidh an cúram – an mbeidh aon roinn nó fo roinn ann le cúram na Gaeltachta air? Cad faoi Údarás na Gaeltachta, Foras na Gaeilge, An Choimisinéir Teanga? Cad faoin Ghaeltacht féin? Ceisteanna móra iad seo don Ghaeltacht ach is ceisteanna beaga iad sa mhór phobal. Go h-áirithe nuair atá moltaí á dhéanamh go mbeidh comhairlí áitiúla á chomhnascadh is eile. An cheist eile, ar ndóigh: an gá go mbeadh seo ina droch rud amach is amach don Ghaeltacht is don Ghaeilge? An bhfuil rudaí ‘maith go leor’ mar atá? An deis é seo an Ghaeltacht a athshamhlú gan an maorláthas ar fad a bhain leis an Roinn seo? Foilsiú: 16/07/2009 . igaeilge a d’fhoilsigh. Ranganna: An Ghaeilge, Cúrsaí Reatha. Clibeanna: An Roinn Ghnóthaí Pobail, Tuaithe agus Gaeltachta. Ó Cuív ag scaipeadh mí-eolais? De réir eolais atá faighte agam agus atá go h-iomlán iontaofa, is cosúil go bhfuil an tAire Ghnóthaí Pobail, Tuaithe agus Gaeltachta ag scaipeadh mhí-eolais. B’fhéidir nach bhfuil sé á dhéanamh san d’aon ghnó – ach is mí eolas atá ann ar aon nós. Seo a deirtear liom: go bhfuil an Fhoras ar an eolas le mí anuas nach raibh Moinéar Teorannta sásta glacadh leis an gconradh ar €355,000 nó, fiú, ar €400,000 in aghaidh na bliana. Glacaim leis go bhfuil sé amhlaidh de bharr go bhfuil na cúinsí faoina raibh an nuachtán beo nuair a luadh an figiúir €400,000 athruithe go suntasach – gan aon dul chun cinn ar cheist na bhfógraí, mar shampla agus laghdú dá réir ar theacht isteach an nuachtáin agus go bhfuil ualach trom á lorg ag an bhForas sa bhreis ar an méid atá Foinse sásta solathar ar an €355,000 (leathnaigh breise, suíomh idirlín neartaithe is uile). Deirtear liom freisin gur chuir Foras na Gaeilge an conradh nua chuig Moinéar Teo ar an 4ú Meitheamh agus gur chuir Pádraig Ó Céidigh freagra i scribhinn an lá céanna ag cur in iúl nach mbeadh sé ag glacadh leis an gconradh nua. Ar an raidió ar maidin, dúirt an Aire gur inné (Dé Chéadaoin) an chéad uair a cuireadh diultú Moinéar Teo in iul don Fhoras go foirmeálta. Níl sé sin cruinn. Is mí-eolas é agus níl a fhios agam cad as a bhfuair Ó Cuív an t-eolas ach ba cheart do filleadh ar an bhfoinse arís agus é a cheistiú go dian faoi sin. Dá mba amhlaidh go raibh foras stáít ag cur Aire na mathair roinne ar mhí eolas faoi cheist chonspóideach – nó faoi cheist ar bith – bheadh iarmhairtí tromchúiseacha ansan d’fhoinse an mhí-eolais, bheinn ag súil. Is léir go bhfuil mearbhall nó mí eolas ar an Aire freisin i dtaobh treimhse chonartha Foinse. Tháinig deireadh le conradh Foinse ag deireadh mhí Lúnasa anuraidh. Ó shin i leith tá siad ag feidhmiú ar shíneacha chonartha, ceann amháin go deireadh Nollaig, ceann eile go deireadh mí Márta agus roinnt shíneachaí níos giorra ó seo go dtí 15ú Meitheamh, sé sin Dé Luain, nuair a thiocfaidh deireadh leis an gceann is déanaí. An slí a oibríonn sé sin, go mbionn ar an t-é atá ag súil le conradh nua feidhmiú de réir téarmaí an sean chonartha agus glacadh leis an iocaíocht a bhí ceadaithe de réir an sean chonartha fhaid is atá an conradh nua á ullmhú. An deacracht le sin, go mbeadh an t-é atá ag feitheamh ar chonradh nua thíos leis an gcaillteanas fhaid is atá siad ag feitheamh. Maith go leor más orthu an locht as an mhoill. Ach cé ar atá an locht sa chás seo? D’fhógair Foras na Gaeilge an chomórtas oscailte i mí Bealtaine agus a fhios acu, ní foláir, go mbeadh deireadh leis an gconradh reatha ag deireadh mí Lúnasa. Nior fhag an Fhoras a dhothain ama chun conradh nua a chur in áit roimh don sean cheann imeacht in éag. Agus rinne an Fhoras talamh tirim den diogras agus den dílseacht ó Foinse go bhfanfadh an nuachtán ag foilsiú fiú is go raibh an nuachtán, ag an am sin, ag cailliúint airgid de bharr an ngearradh siar ar fhógraí stáit. Ní h-é ná raibh a dhothain ama idir 2004, nuair a thosnaigh an chonradh ceithre bliana seo, agus 2008, nuair a chriochnaigh sé le bheith ag ullmhú. Cad a bhí ar bun ag an bhForas sa tréimhse sin? Cé gur chreideas gur €320,000 a bhí á fháil ag Foinse, is €298,000 in aghaidh na bliana a fuair siad don bhliain reatha. Is soileiriú an méid sin ar an lúb ar lár a d’aithin mé i dtrachtaireaht eile. Mo bhotún féin a bhí ann – mo leithscéal as sibh a chur ar mhí eolas. Ag an bpointe seo, níl sé soiléir cé acu an mbeidh nó nach mbeidh eagrán Foinse ann i ndiaidh eagrán an Domhnaigh bhig seo. Tá súil agam go mbeidh. Misneach a cháirde! Nuair atá ár gcuid namhaid ag brath ar bhréaga agus ar mhí eolas, is léir go bhfuilimíd ar an dtaobh ceart! Foilsiú: 11/06/2009 . igaeilge a d’fhoilsigh. Ranganna: An Ghaeilge, Cúrsaí Reatha. Clibeanna: An tAire Ghnóthaí Pobail, Éamon Ó Cuív, Foinse, Foras na Gaeilge, Pádraig Ó Céidigh, Tuaithe agus Gaeltachta. Is féidir teacht ar an t-agallamh a cuireadh ormsa ar An Samhradh Thoir trathnóna Dé Chéadaoin ar an láthair seo – níl sé ar fáil i bhfoirm podchraolta, is oth liom a rá. Agus mé ag éisteacht le hAdhmhaidin inniu, thug mé cluas don mhéid a bhí le rá ag an Aire Ghnóthaí Pobail, Tuaithe agus Gaeltachta, Éamonn Ó Cuív, i dtaobh an aighneas/plé/cibé idir Foinse/Moinéar Teoranta agus Foras na Gaeilge maidir leis an gconradh chun an nuachtán sheachtainiúil a fhoilsiú as seo go 2013. Bhí sé amhail is go raibh mé ar ais i bhFeabhra 2008 nuair a bhí na deacrachtaí ag Lá Nua. Céard a deir siad faoin stair – go dtarlaíonn sé an chéad uair mar thragóid is an dara uair mar sheafóid – nach ea? Ar aon nós, bhí sé amhail is go raibh an Aire fós siocaithe sa sean ré sin, é fós ag seasamh go daingean leis an bhForas agus a insint ar an scéal. Nó bhí sé ag cur an chuma sin air féin, ar aon nós. Dar leis an Aire gur pointe tabhachtach é ná raibh sé curtha in iúl go foirmeálta ag Moinéar Teoranta go raibh an comhlacht chun glacadh leis an gconradh a bhí ar thairiscint ag an bhForas agus gur trua leis, dá réir, go raibh sé roghnaithe ag Moinéar Teoranta an scéal a chur os comhair an phobail sara phléig siad leis an bhForas é. Fair plé do agallóir an Raidió a thug le fios ná raibh sa chruinniú inné ach cruinniú i sraith cruinnithe a mhair roinnt seachtainí nó, go deimhin, míonnaí agus go raibh a fhios go maith ag an bhForas cad é an seasamh a bhí agus atá ag Moinéar Teoranta ar an gconradh nár shíl siad bheith leor dhothanach. D’fhéadfaí a rá freisin go raibh sé ráite roimhe seo ag Ferdia Mac an Fhailigh agus é faoi agallamh ar Adhmhaidin tar éis gur fhogair an Fhoras go mbeadh conradh arbh fhiú suas go dtí €400,000 é ar fáil don iarrthóir a bhuaigh an chomórtas don nuachtán seachtainiúil (móide an seirbhís idirlín). Tá an €355,000 in aghaidh na bliana atá á thairiscint ag an bhForas píosa maith níos lú ná sin – €180,000 thar ceithre bliana. Moladh amháin atá agam a fhéadfadh an chás a réiteach – dá bhféadfaí an bearna sin idir €355,000 agus €400,000 a threasnú agus réamh íocaíocht de €180,000 breise a thabhairt anois do Foinse, chiallódh sé ná raibh an bun thairiscint á sharú (cé go raibh sé á lúbadh go géar) agus chuirfeadh sé gaoth i seolta Foinse agus bheadh sé faoin nuachtán ansan teacht slán trí na blianta atá romhainn. Ní thagaim le Pádraig Ó Céidigh nuair a mhaíonn sé go bhfuil suíomh idirlín Foinse níos fearr ná aon suíomh atá ag na meáin Bhéarla – tá píosa fada le dul aige go fóill go mbeidh sé fiú chomh maith agus a bhí suíomh Lá Nua. Ní oibríonn nuachtán seachtainiúil ró mhaith ar shuíomh idirlín – má bhionn an scéal céanna an cúigiú lá i ndiaidh foilseacháin agus a bhí ar lá an fhoilseacháin, is droch theist é sin ar an suíomh. Ach tá an suíomh níos fearr ná mar a bhíodh sé agus tá sé ag dul sa treo ceart – céimeanna fiúntacha chun tosaigh iad na podchraoltaí, an scrúdú béil, an leagan PDF (2/3 a la Lá Nua). Measaim gurb é an bun rud a chaithfidh an Fhoras agus an Aire a thuiscint, nach bhfuil grúpaí amuigh ansin ag iarraidh an cailís nimhe seo, nuachtán Ghaeilge seachtainiúil a fhoilsiú trath go bhfuil nuachtáin i dtrioblóid. Ní doigh liom go dtuigeann an Aire an teachtaireacht atá sé ag cur in iúl do dhiograiseoirí ar nós foireann Foinse agus úinéir an nuachtáin. Tá sé ag cur pionós orthu as ucht bheith ag plé leis an nGaeilge. Níl aon tuiscint á léiriú aige ar an gcaillteanas leanúnach atá á fhulaingt ag Ó Céidigh óna phóca féin de bharr seo – €5,000 nó €6,000 sa tseachtain as a phoca féin, an mbeadh an Aire sásta é a thabhairt? Ní thuigeann sé ach an oiread an dua agus an diograis atá á léiriú ag foireann an nuachtáin agus tá comhbhá ar leith agam don eagarthóir, Seán Tadhg Ó Gairbhí. Cé go mbím ag aighneas leis ó am go h-am ar chúrsaí éagsúla a bhaineann leis an gcéird seo, is iriseoir den scoth é agus is eagathóir cumasach é atá ar a dhícheall ag iarraidh nuachtán a choimead os cionn uisce trath go bhfuil na farraigí ina bhfuil sé ar snamh suaite go maith. Ní bhionn a leithéid sa ghnó seo ar son an airgid. Ghlac sé agus foireann uilig Foinse le h-ísliú pá i mbliana roimhe seo. Agus cé is cúis le seo? Cé eile ach an Aire atá, de réir a chaint ar maidin, fós gan dul chun cinn a dhéanamh ar cheist na bhfógraí Ghaeilge. Dar leis an méid a bhí le rá aige ar maidin, caithfear ceist na bhfógraí Rialtais ar fad a réiteach sara reiteofaí an cheist seo. Maith go leor a Aire! Ach cén fath go bhfuil moill ar seo? Cad é atá ar siúl chun an cheist a réiteach? 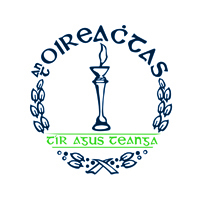 Cén uair a bheidh an gcruinniú seo den choiste Oireachtais a luaigh tú roimhe seo? Tá bliain caite ó chuir tú i bhfeidhm na míreanna eile den reachtaíocht – tá sé in am do lámha a bhaint amach ó faoi do thóin. Is cinnte go bhfuil ceist anois i measc phobal na Gaeilge faoi inmharthanacht an Aire seo – agus tá go leor cainte sna meáin go mbeidh sé á bhogadh i dtreo na gcúlbhínsí gan ró mhoill. Cuireann sé fearg ar dhaoine bheith ag éisteacht leis, tá sé ró ghafa le rialacha agus le h-easpa gnímh. Tá seans aige a léiriú anois go bhfuil samhlaíocht aige agus gur fear gnímh é – ba cheart do an deis sin a thapú agus teacht i gcabhair ar Foinse nó ní bheidh pobal na Gaeilge buioch do. Foilsiú: 11/06/2009 . igaeilge a d’fhoilsigh. Ranganna: An Ghaeilge, Cúrsaí Reatha. Clibeanna: An tAire Ghnóthaí Pobail, Éamon Ó Cuív, Foinse, Foras na Gaeilge, Tuaithe agus Gaeltachta. Cad a dhéanfaimís feasta gan POBAL? Cé go gcuirim a mhalairt in iúl ó am go chéile, tuigim go bhfuil gá agus riachtanas le reachtaíocht chun an Ghaeilge a chosaint. Is amhlaidh nach gcreidim go bhfuil an chosaint chuí á thabhairt ag Acht na dTeangacha Oifigiúla don teanga. Is cairt mhaorláthach atá ann seachas cáirt cosaint teanga. Ag an am chéanna, caithfear dul i ngleic leis an maorláthas céanna agus an teanga a bhaineann siad úsáid as a úsáid chun cosaint cheart a fháil don Ghaeilge. Sin é go díreach an obair barr riachtanach ar bun ag POBAL ó thuaidh. Bionn POBAL de shior ag stocaireacht, ag beartú, ag gníomhú agus ag plé le na h-udaráis ar mhaithe leis an Ghaeilge agus pobal a labhartha. Ní doigh liom go bhfuilim ag tabhairt masla d’aon ghrúpa teanga eile san oileán má dheirim nach bhfuil a sarú le fáil. Is é seo an obair leadránach, dúinne nach bhfuil ag gabhail do pé scéal é, fadalach, tuirsiúil, gan buiochas, atá á dhéanamh ag POBAL. Obair riachtanach atá i gceist agus obair nach bhfuil á dhéanamh ag aon pháirtí pholatúil agus atá ina acmhainn ag gach páirtí polatúil…..
Agus léirigh siad an barr feabhais atá ar a gcuid oibre nuair d’áitigh siad ar na Náisiúin Aontaithe tacú le seasamh POBAL go bhfuil Rialtas na Breataine ag cliseadh ar a ndualgaisí i leith na Gaeilge. Sin rud nár dhein Coiste Cearta Shoisialta, Eacnamaíochta agus Cultúrtha riamh roimhe, ráiteas a éisiúint ar cheist teanga mar seo. An tseachtain seo chaite a d’éisigh na Náisiúin Aontaithe an daorbhreith seo ar mhí-iompar Rialtas na Breataine i leith na Gaeilge. Cé gur feidir go dtugtar neamairt ar an iompar seo, b’fhearr liomsa mí-iompar a thabhairt air. Aithníonn Rialtas na Breataine go bhfuil gá cosaint a thabhairt do Ghaeilge na hAlba in Alba agus don Bhreatnais sa Bhreatain Bheag – ach ar chúis éigean ní féidir leo na dualgaisí atá orthu maidir leis an Ghaeilge a aithint i dtuaisceart na hÉireann. Bhí sé suntasach go raibh sé luaite sa ráiteas a d’éisigh na Náisiúin Aontaithe go raibh gá le cosaint reachtúil ar nós na reachtaíochta sna tíortha eile – ach anuas ar sin go raibh gá le cead an Ghaeilge a úsáid sna cúirteanna agus, freisin, go raibh sé riachtanach go mbeadh an Ghaeilge á chraoladh sna meáin chraolta. Dar liomsa ní fiú morán reachtaíocht ar son na Gaeilge mura bhfuil cosaint á thabhairt don Ghaeilge sna meáin, sna meáin chraolta ach go h-áirithe. Tá sin soiléir ó dheas nó, mar atá léirithe agam ar an mblag seo anseo, tá sceannairt á dhéanamh ag RTÉ ar chláracha chúrsaí reatha i nGaeilge ar sceideal RnaG agus iad ag iarraidh ciorruithe a dhéanamh. Go deimhin is dócha go bhfuil cosaint ag an nGaeilge sa reachtaíocht faoinar bunaíodh RTÉ ach is beag ceann seachas béal craiféacht a thugann an Chraoltóir Náisiúnta do sin. Tá reachtaíocht, bunaithe ar phroiseas chomhairliúcháin fadalach agus cuimsitheach, cumtha ag POBAL chun cosaint a thabhairt don Ghaeilge ó thuaidh. Reachtaíocht ceart bhunaithe atá ann – seachas scéim bhunaithe. Níl aon suim ag Feidhmeannas an Tuaiscirt rud ar bith a dhéanamh faoi – agus bí cinnte de seo, má chuireann siad reachtaíócht ar na leabhair lá i bhfad nios faide anonn, beidh an reachtaíocht sin bunaithe ar chur chuige gan chnamhdroma na reachtaíochta ó dheas sna 26 contae seachas ar reachtaíocht POBAL. Sin an chomhairle atá tugtha go minic ag an Aire Ó Cuív d’údaráis an Tuaiscirt nó tá sé ráite aige sa Dáil go gcungaíonn an reachtaíocht, Acht na dTeangacha OIfigiúla, na dualgais atá ar an stat ar aon nós, de réir na Bunreachta, maidir leis an nGaeilge. Foilsiú: 02/06/2009 . igaeilge a d’fhoilsigh. Ranganna: An Ghaeilge, Cúrsaí Reatha, Nuacht. Clibeanna: Acht na dTeangacha Oifigiúla, Acht na Gaeilge Tuaisceart Éireann, An tAire Ghnóthaí Pobail, Éamon Ó Cuív, Janet Muller, POBAL, Tuaithe agus Gaeltachta. Tá sraith chruinnithe phoiblí á reachtáil ag Údarás na Gaeltachta mar chuid d’iarracht an phobal sa Ghaeltacht a chur ar an eolas faoin éifeacht a bheidh ag na ciorruithe atá déanta ar an eagras ar fheidhmiú an eagrais, na dúshláín atá roimh an eagrais agus romhainn go léir agus an cur chuige ar ghá chun aghaidh a thabhairt ar an dtodhchaí. Aréir bhí an chruinniú i Múscraí agus bhí an seomra mór in Ostán Ghobnatan i láthair chun cluas a thabhairt do Phríomh Fheidhmeannach an Údaráis, Pádraig Ó hAoláin, agus é ag caint go díreach, ar bhealach nár chuala mé aon fheidhmeannach shinsearach ó eagras stait ar bith eile, leis an bpobal faoi na dúshláin atá romhainn agus an cur chuige ar ghá. Tá buairt ar leith freisin i Múscraí de bharr an phlean atá ag an Aire Ghnóthaí Pobail, Tuaithe agus Gaeltachta, Éamon Ó Cuív, chun Meitheal Forbartha na Gaeltachta agus Údarás na Gaeltachta a chomhnascadh. Tá aonad den Mheitheal, Meitheal Mhúscraí, ag feidhmiú sa cheantar agus ag cur réimse leathan sheirbhísí ar fáil, go h-áírithe don dhream aosta agus daoine eile a bhí ar an imeall le linn ré an Tiogair Cheiltigh. Bhí siad ann aréir agus iad ag cur in iul nár cheart baint den Mheitheal. Foilsiú: 20/05/2009 . igaeilge a d’fhoilsigh. Ranganna: An Ghaeilge, Cúrsaí Reatha, Nuacht. Clibeanna: An tAire Ghnóthaí Pobail, Éamon Ó Cuív, Ciorruithe, Meitheal Forbartha na Gaeltachta, Meitheal Mhúscraí, Pádraig Ó hAoláin, Tuaithe agus Gaeltachta, Udarás na Gaeltachta. Foinse – Pravda Uí Chuív? Táim i gConamara, ag céad comaoine mo neach, agus níl locht air mar ocáid teaghlaigh. Is mór an áthrú é ón ocáid teaghlaigh dhgeireannach a thug sinn le chéile, sochraid m’athair, tuairim is leath bhliain ó shin anois. Táim ag scriobh an meid seo ar iPhone ague níl sé éasca. Ag léamh Foinse dom tar eis aifrinn, aithnim an bhearna ata fagtha le dúnadh La Nua. Is léir dom ó thuairisciú ‘phríomh nuachtán naisiúnta na Gaeilge’ – nó an neamh thuairisciu – go bhfuil pé cnamh droma a bhí ag an nuachtán caillte. 1. Le linn na seachtaine, sheol an Choimisinéir Teanga a thuairisc bhliantúil. Tá tuairiscí is eagarfhocal ar an dtuarascáil i bhFoinse ach ar eigean gur luadh failli Roinn Ui Chuiv i leith na reachtaiochta agus go h-airithe, níor luadh an faillí atá déanta ag an Roinn a reachtaigh Acht na dTeangacha Oifigiúla agus a chum agus a cheap cur chuige na scéimeanna i leith a scéim teangan féin. 2. Go fóill níl tagairt ar bith sa nuachtán seo ar an bplean atá ag an Aire Uí Chuív aonad aistriúcháin a bhunú agus an costas a bheadh air. Is scéal mór é seo i saol na Gaeilge – ach ní aithníonn an ‘phriomh nuachtán’ gur amhlaidh atá. 3. An mó pictiúr d’Éamon agus An Taoiseach ar gá a fhoilsiú in aon eagrán? Ní h-amháin go bhfuil an argóint ann – agus ann go láidir – go bhfuil an nuachtán claonta go mí nadúrtha i dtreo amháin ó thaobh na polataíochta de ach is léir freisin go bhfuil Foinse ar chúl na h-imeartha maidir le scéalta móra na Gaeilge. An tseachtain seo chaite bhí fógra sa nuachtán faoin Stiurthóir Aistriúcháin agus ní raibh an scéal ann. An tseachtain seo bhí an scéal mór ag Nuacht 24 faoi phlean an Aire ‘Údarás na Gaeilge’ a dhéanamh de Údarás na Gaeltachta agus agallamh leis an Aire faoin phlean seo. Ach ní raibh rian den scéal i Foinse. Tuigim go maith go bhfuil todhchaí an nuachtáin idir dhá cheann na meá faoi láthair agus an Fhoras – Dia idir sinn agus an t-olc – ag plé téarmaí an chonartha úir leis an fhoilsitheoir, Pádraig Ó Céidigh. Ach ni leithscéal é sin an súil a bhaint den liathróid. Is é priomh ghnó an nuachtáin iriseoireacht a dhéanamh, seachas bolscaireacht ar son pháirtí nó fiú aire ar leith. Is mó an chosúlacht idir Foinse agus ‘Pravda’ Uí Chuív anois ná riamh. Foilsiú: 16/05/2009 . igaeilge a d’fhoilsigh. Ranganna: An Ghaeilge. Clibeanna: Aistriúcháin, An tAire Ghnóthaí Pobail, Éamon Ó Cuív, Údarás na Gaeilge, Foinse, Lá Nua, Nuacht 24, Pravda, Tuaithe agus Gaeltachta.